The monthly progress meeting of Saudi Aramco Ex-Employees Association (SAEEA) was held on June 07, 2014. KAF highlighted the activities occurred during the month of May 2014. KAF thanked GQK who provided his house for the meeting and arranged a very delicious lunch for all the attendees. As a result of SAEEA Representatives visits to various SAEEA Members residences, the attendance during the 10th Reunion was increased. KAF emphasized in visiting SAEEA permanent Members regularly, especially sick persons. Accordingly, immediately after the meeting the representatives visited Aziz Ur Rehman Khan, who was hospitalized in a local Heart Institute. Mr. Khan had heart problem and was operated on June 03, 2014. All the Representatives then visited Zubair Ahmed, who was missing from SAEEA reunions for quite some time, Zubair, not only paid his annual subscription, but promised attending all future SAEEA functions. During the course of 10th Reunion, quite a big number showed interest in having a picnic in a Farm House, close to Karachi, instead of holding SAEEA 11th Reunion in a restaurant. At the same time we shall celebrate SAEEA 4th Anniversary and Eid Milan as well. The tentative date for the function/picnic is August 10, 2014. KAF with the agreement of all attendees, requested MAM for seeking help from Khaliluddin Qureshi in organizing the function. Formal suggestion forms were circulated during the 10th reunion. Most of the attendees just appreciated the working of current SAEEA. However, few came up with some good suggestions. SAEEA will review the suggestions in their next meeting and will check the possibility of implementing the good suggestions. SAEEA Stage Secretary, Syed Shahid Ali suggested for a stand-by Stage Secretary. 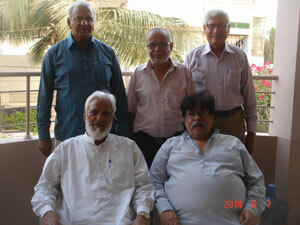 All SAEEA Office bearers unanimously agreed in keeping the name of Qamar Ahmed Khan as a stand-by Stage Secretary. SAEEA representatives will officially contact Mr. Khan to appraise the request. KAF requested three office bearers to survey the market in order to having our own sound system, instead of renting it every time. IAK informed that the SAEEA website is updated as of date. Few requests were received to convert the scrolling in the home page of SAEEA website into a moving bar. The webmaster will be requested to do the needful. MSH presented the SAEEA updated accounts. MSH requested all the SAEEA Members to deposit their annual subscription (July 01, 2014 thru June 30, 2015) through Bank, cheque or any of SAEEA Office Bearer. MAM informed that few ladies purses and wallets were requested by Members. They were ordered and will be delivered soon. KAF prayed for all sick people, especially for Aziz Ur Rehman Khan and for those who are not with us anymore.